When the heat of the Summer Sun has become too much for you to bare the only thing to do is sit back and relax with a long cold glass of something delicious……. but is this possible as a red drinker?? As a Red Wine lover I have always found Summer difficult, when the heat is on all I want a cold drink! So what is the solution? 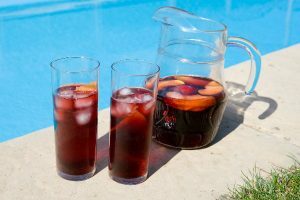 Turn to the much loved Spanish tradition of Sangria; sounds good to me! Here is a quick, easy and most importantly DELICIOUS recipe that can be whipped together in seconds with your favourite red, a bit of rum for a kick and fruit for some zesty palette cleansing. Find your favourite water pitcher or jug and add the wine, brandy and OJ. Here is where you can add a little sugar if you have a sweeter taste but i find if the oranges are ripe they work perfectly. Add the fruits and put in the fridge for at least an hour then add cold Soda water to serve. If you want to drink it immediately then add the cold Soda and lots of ice. Serving suggestion: find a lounger by the pool and a good book!